04 Mart 2019 Pazartesi 08:01 - 3 reads.
" We have sent patrol, fjällräddare and a police helicopter. We have not received any information that there should be no casualties, said police presstalesperson Marie Andersson initially. the Bus drove into the ditch and overturned shortly after noon to 13 on Sunday. The dmv confirms that the bus is danskregistrerad and the travellers are young people on a school trip. According to the police, have any been brought to the health centre in Sveg, but no one is seriously injured. 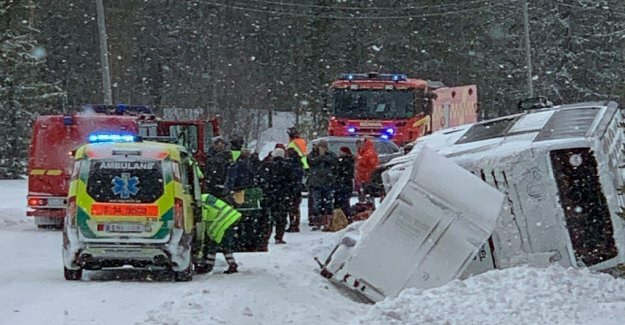 "It was a double decker and it was a soft landing in the snow," says one of the passengers to the SVT Jämtland. that was shut down by between Sörvattnet and Linsell during the rescue effort. Those affected have been brought to a collection point on the Glötegården.
" We are taking a number of investigative measures and, where included, among other things, that we have checked, the driver's sobriety and it was without remark. The scene of the accident to be documented and we will keep the interviews with the different parties involved, " says Marie Andersson.